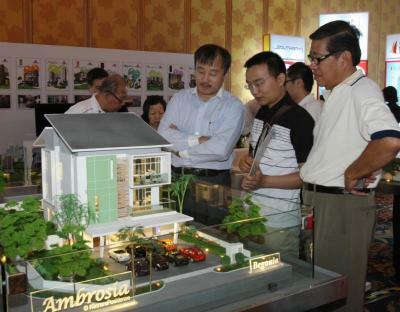 Potential buyers: Visitors checking out scale models of Mah Sing Group’s latest developments. The Mah Sing Group launched its 18th anniversary celebrations with a bang last Saturday, and in conjunction with the milestone has kicked off a three-month long property and lifestyle showcase called “Realising Dreams”. To show its appreciation to its 12,000 property buyers over 18 years and new buyers, the Mah Sing Group has designed special incentives from June 16 to Sept 15. Eleven landed and high-rise residential and commercial projects in Kuala Lumpur, Penang island and Johor Baru have been selected for the campaign. During the period, property purchasers of Icon City (Petaling Jaya), M City (Jalan Ampang), Icon Residence Mont Kiara, Garden Residence and Garden Plaza (Cyberjaya), Kinrara Residence (Puchong), Lagenda@Southbay (Penang), Southbay Plaza (Penang) and Austin Suites (Johor Baru) will enjoy the developer interest bearing scheme (DIBS), where buyers only pay downpayment and nothing else until the completion of the property. A key proposition of the campaign is to make it easier for buyers to own their dream properties with affordable downpayments of 2% payable via 0% easy payment programmes of up to 36 months with selected banks. Qualified buyers will benefit from the anniversary lifestyle package of up to RM488,888 depending on the property purchased. Mah Sing will also absorb the legal fees for the sales and purchase agreement and loan agreement for all 11 participating projects. Mah Sing’s M Club members will enjoy repeat purchase discounts of up to 1.8%, while purchasers will enjoy buyer-get-buyer rebates of 1%. What’s cooking? : Chef Wan doing a cooking demo during the Mah Sing Group’s 18th anniversary celebrations. The company is also giving away monthly prizes to lucky Mah Sing property buyers. The monthly prizes will lead to a grand prize at year end where the winner gets a unit of serviced residence at Graden Plaza in Cyberjaya worth RM300,000. The campaign’s roadshow will continue at Equatorial Hotel Penang from June 22 to 23 and later in Johor on June 30 and July 1. Mah Sing group managing director and group chief executive Tan Sri Leong Hoy Kum said selecting a Mah Sing property was very easy as the company was one of the few developers to build landed and high-rise residential, commercial and even industrial products in all property hotspots. “With our attractive promotions for this celebration, we make it easy for everyone to own a dream house,” he said during the launch at Shangri-La Kuala Lumpur. Leong said the company planned to launch six more projects next year. Also present at the event were Mah Sing Group Berhad executive directors Lim Kiu Hock and Steven Ng. Emceed by Xandria Ooi and Kevin Chong, the launch saw the China Bond Girls and Shanghai Star Acrobatic Ballet in action. 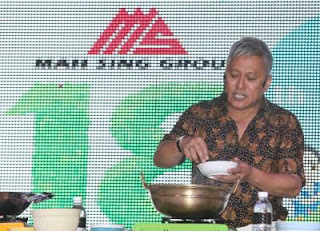 There were also a series of talks by celebrity chefs Chef Wan and Chef Daisy, and feng shui and Vashtu Sastra talks.